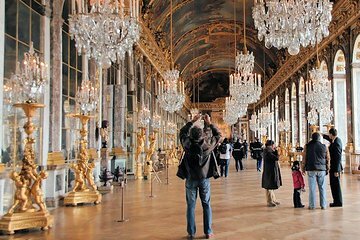 Undslippe travlheden i Paris og fordybe dig i den overdådige verden af ​​Versailles på en halvdags lille gruppe tur. Med din billet kan du nyde prioriteret adgang til slottet og tage en guidet tur gennem slottet og haverne. Vidne til Louis XIV's ekstravagance, der udviklede det massive 700-rumskompleks og pryder hvert værelse med luksus til det franske monarki. Sommertid besøgende kan opgradere til at deltage i musikalske haver eller springvand show. Very nice driver. On time for pick up and drop off.No waiting on the line to go inside the castle.Very well organization. We had the driver pick us up at the hotel. The driver was excellent. The Versailles palace is beautiful. We missed the fountain show. Not able to find it and no one around to ask. The minibus service fine, although the day we went it took 3 minibus to accomodate all of the travellers. One of the drivers got stuck in traffic on the return trip, so was late for the pickup but the other drivers shuffled and took care of it. The guides from the drop-off point into Versailles was a disappointment. Not sure exactly what Skip-The-Line means here but we walked to outside the ticket area where they then went into to get our tickets, and then came back and told us that they were being printed. We waited in the sun for about 30 minutes waiting on tickets. Our guide then took us thru the entrance and got our headsets and left. Not much of a guiding experience. We were on the full day tour and had to ask our guide for our garden tickets. I did not think this was well organized at all. Once inside, and on our own then the self guided tour of the palace was fine, although very crowded. The palace tour only took a little over an hour, and the half day tour may have been a little tight to see all of the gardens but I'm not sure you need to. We wound up killing a lot of time. The meeting place is at a small restaurant, and it was a wonderful place to get lunch and people watch while waiting on the return shuttle. Really convenient tour, excellent driver Pascal, you were lovely!, and beautiful part of French history. We arrived on a little street corner to meet up with our guide and the rest of our group. This specific Viator tour just gives you a person to give you the tickets and organize your meeting point. This is NOT a tour guide taking you through the buildings themselves. This could have been more organized, but I don't think that was our guide's fault. Tickets should be able to be printed prior to guests arriving instead of waiting outside for 30 minutes while our coordinator went inside to get them printed. Large groups to pass out tickets to, just took a lot of time. This is an audio guide tour with a little handheld phone you type in the room number and it tells you all about it. A fine way to see such a monument. Versailles palace itself is SO overcrowded you could barley even walk into the next room. It was hot and bustling and shuffling. There is no way to fix this, but just be warned before you go! Paid for hotel pick-up and drop- off, priority entry and full access. Driver was late he did call, a plus, we DID NOT HAVE PRIORITY ENTRY. People did not show up, our guide did not have tickets, her partner wasn't there with the tickets therefore we waited in the crowd for over an hour, in the rain just to get to the security gate. From hotel pickup to entry into the palace was two hours. Were warned to use restrooms immediately as they are only available at entry and exit. Stood in another line. Entered the Palace and the crowds were unbearable. Could not see anything as we were packed in like sardines. Tour leaders and their tourists pushed and shoved everyone aside. Rude doesn't cover it. So sorry we opted for this venue - I would see more in a video. The rain ended and we did the full access tour outside - that was fine. The gardens are wonderful and glad to see them in person but not at the price we paid. We met our driver on time but he was not able to drop us off at our hotel because of traffic and a construction crane not his fault - he was a good guy. We got close to our hotel and walked. I do not recommend this tour. Too disorganized and not what we paid for priority access. Very good value for money. Good driver no guide but I felt that he could have made some casual comments during the trip in relation to landmarks, just highlighting some of the items of interest would have lightened the mood. I appreciate that the driver is not a guide and that guides generally put a lot of time into their presentation however a few comments would have added significantly to the experience. Our driver picked us up promptly as planned. He was very courteous and gave us good information and historical facts about Paris along our trip to Versailles. Once we got to Versailles he explained where we would meet our guide to get our audio guides. All went well and we had a wonderful self tour through Versailles and the gardens. He met us as planned and returned us to our hotel. It was a very good experience! I really wanted to skip the line and get transportation to Versaille. It was raining and I wanted to make the most out of my time. I would not book this way again. The ride was great, but then you are obligated to ride back with them at a set time. I wish we had one more hour. The guide really was there to just get our tickets, and get us through the group entrance. On a typical, non-winter, non-rainy day, I suppose this would work great. I'd rather find my own way there and get a skip the line pass some other way. For me, this was a total waste of money. The drive out to Versaille is about 45 minutes. It is beautiful and a must see! efficient....versailles is a zoo so if you go I guess this at least makes getting there easier but the sketchy audio tour isn't their fault and crowds in December! booooo have no remedy either. Our tour driver and fellow travelers were great. The experience at Versailles was less than awesome...soooooo crowded!!! Way too many people at one time...rude people as well. The outdoors was fine...very nice!